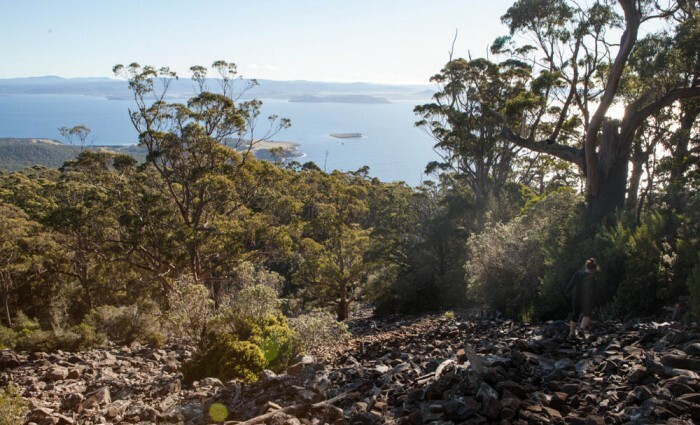 Located on the northern end of Maria Island, the Bishop and Clerk walk is a fun and challenging day walk offering brilliant coastal cliff-top views. Requiring 4 – 5 hours to complete, this steep 12km walk can be done during a day visit or overnight stay on the island. Highlights also include the Fossil Cliffs and a number of convict and early settlement ruins. View Google Map Directions Located off Tasmania’s east coast, Maria Island can only be reached via ferry from Triabunna. For information on travel times and fares please go to mariaislandferry. Take the Tasman Highway (A3) from Hobart through Sorell (Left hand turn in Sorell township). Continue 83km northeast to Triabunna. Just as you reach the township turn right onto Vicary Street and continue for 500m before turning right onto Charles Street. 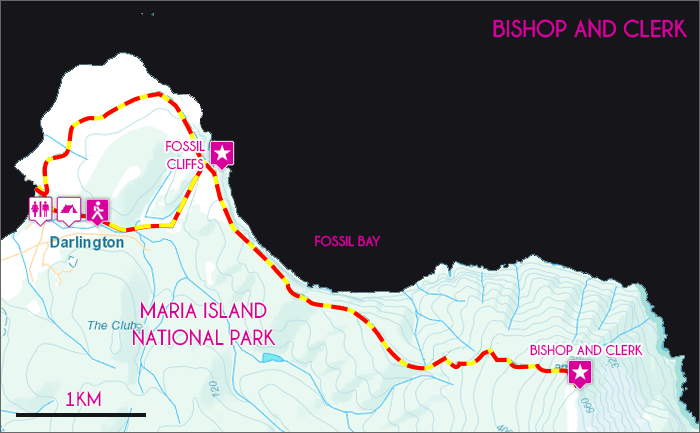 The Maria Island ferry and carpark are located 200m directly ahead on the esplanade. The Bishop and Clerk track leaves from the ferry area at Darlington. The following guide includes a visit to Fossil Cliffs via the coastal track. If limited for time, the direct route via the Darlington Penal Settlement is 2km shorter. From the Commissariat Store at the Darlington ferry area, the trail heads north past the cement works and silo ruins. After a gentle climb, the Convict Barn is met. Filled with early farming artifacts, the barn is worthy of a brief inspection. Continuing on, the free settlers cemetery and airfield are passed before reaching Fossil Cliffs 2km away. This coastal section of track is often frequented by gangs of forester kangaroos and wombats. Made up of thousands of shellfish fossils embedded in lime stone, the Cliffs are one of the best examples of life 250 million years ago found anywhere. From the lower plateau of the cliffs, Bishop and Clerk is clearly seen towering to the east. After exploring the Cliffs the trail climbs steeply over the saddle, briefly descending again before climbing steeper along Skipping Ridge. With a sheer drop to the ocean on your left, the walk along Skipping Ridge is as exhilarating as it is beautiful. Nearing the top of the ridge the trail continues through a shaded forest of eucalyptus and casuarinas. For the next 2km the trail climbs through the forest before meeting a large rock scree. Following the track markers, the zigzagging ascent of the scree is eventually completed. From here the final section of track scrambles through boulders before one final steep climb to the lookout. 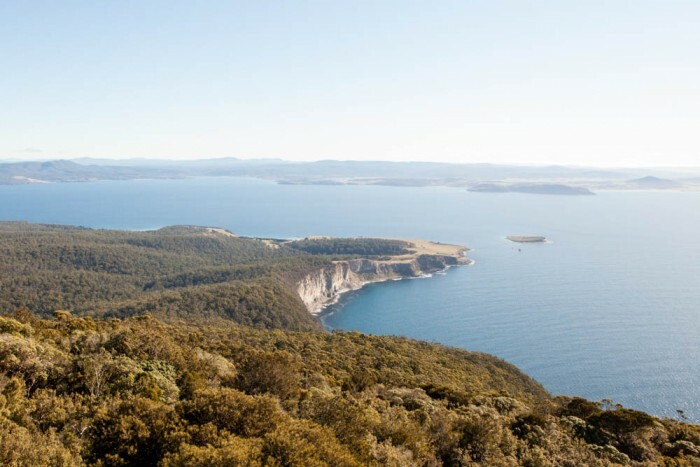 Once at the top, breathtaking views across the Tasman Sea and Maria Island are achieved. On the return to Darlington, take the left track at from the base of Skipping Ridge to pass a series of convict settlement ruins and the original convict quarry.